Renault Trucks will launch a range of electric vehicles in 2019, following ten years of testing electric trucks in real-life conditions with its customers. The all-electric trucks are designed for use in urban and semi-rural areas. 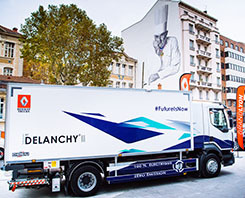 The manufacturer has been carrying out real-world tests on various types of experimental full-electric 12-16 tonne trucks, notably with Speed Distribution for Guerlain, and Stef for Carrefour, Nestlé and the Delanchy Group. It said these tests had provided vital information on conditions of use, battery behaviour, recharging facilities and specific maintenance requirements for electric trucks. In addition to these experimental vehicles, a 4.5-tonne electric truck has been on the market since 2010: the Electric Maxity. “Our commercial experience with the Electric Maxity has enabled us to bring our network up to speed on selling, servicing and repairing electric vehicles,” said François Savoye who is in charge of Renault Trucks’ energy efficiency strategy. The all electric trucks will be produced at the Renault Trucks plant at Blainville-sur-Orne in Normandy, where it is installing a dedicated assembly line.